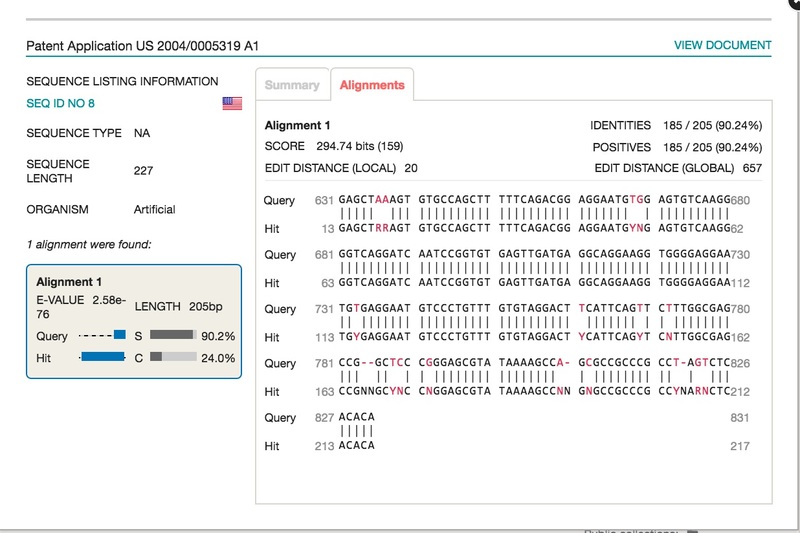 For this demo, let us consider that you have uploaded or pasted a sequence of 838 nucleotide to search and accepted the default search parameters and let us see what results you may be expecting. Results page displays the BLAST search results i.e. the aligned patent sequences to your query sequence with and without their corresponding patent documents. 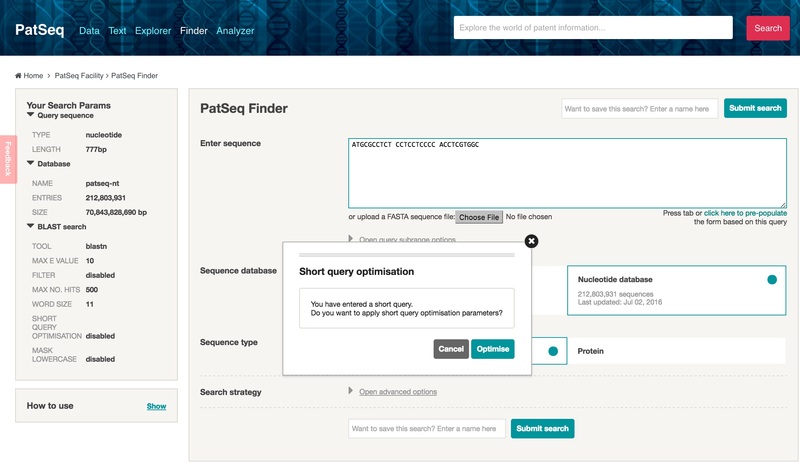 On top of the page, you can check the number of PatSeq Finder results (hits) obtained running the query and learn more about the “Search summary details” in the header. If there is a star next to the hits, then you may be interested in searching for a larger number of hits. To do so, you can click on “modify your search parameters and increase that number in the advanced option menu on the search form page until the star next to the hits disappear. 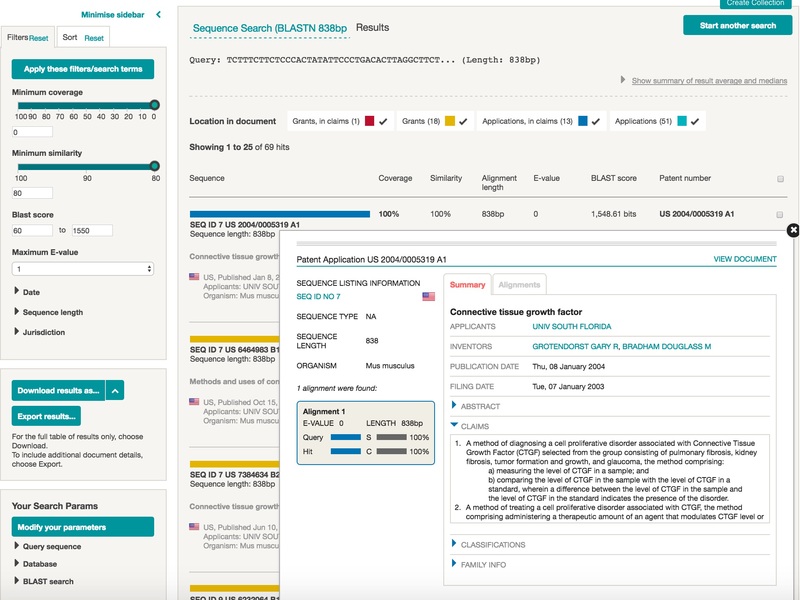 Regions of similarity between your query sequence (nucleotide or protein) and patent sequences referenced in claims of patent documents or simply disclosed in patent documents (grants and applications) are displayed in an alignment browser. Patent sequences are identified by their sequence identification number (SEQ ID No) and in the detailed view, depicted along with their corresponding patent document number, E-value, Similarity and Coverage percentage to the query sequence. Each row represents a patent sequence. By click on the sequence bar, you can view more details on the sequence and corresponding patent attributes in a pop-up window. You can also filter/sort and select aligned patent sequences based on the location of the sequence in patent documents. 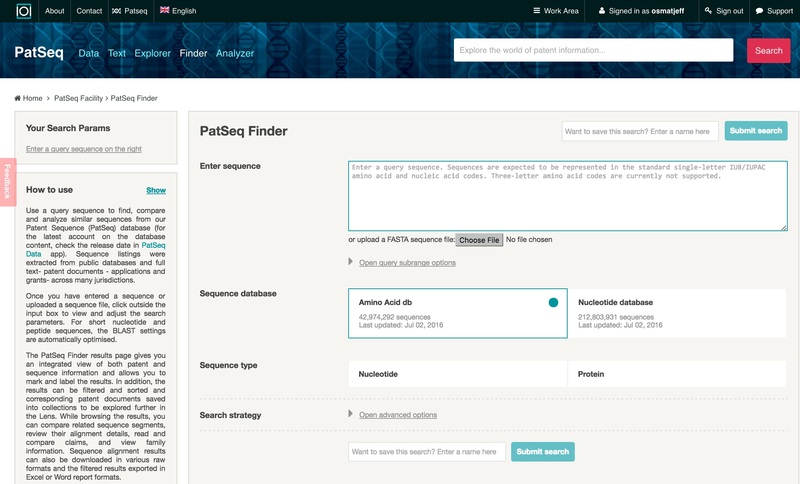 For example, the red category represents patent sequences referenced in the claims of granted patents and number of sequences aligned with the query sequences is shown between parenthesis. As our parsers haven’t been tuned yet to extract the exact position in the fulltext that a SEQ ID NO has been referenced in, we assign the “WDESC” for location code, of course, depending on jurisdiction and fulltext formats available to us. The CLAIM location is not affected by this and extracted separately. If there are more than one segment in a particular sequence that is aligned to the query sequence, they will also be shown in the lower part of the row. Please note that the segments don’t necessarily have to be located in the mapped order or orientation within the patent sequence. If you are interested in filtering further the BLAST results, you can use the left side filter box and select another e-value score, for example, or choose a different coverage, or similarity percentage. 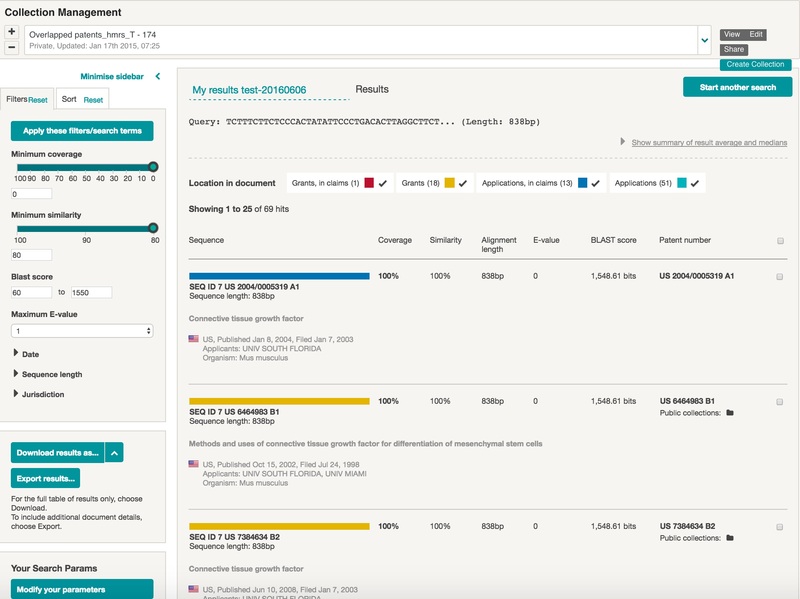 You can download results in multiple formats using the download button and you can even embed the sequence results on your own site using the embed button in the bottom left of the page. You can also export results in an excel or Word document file. Click on “view Document” to go to the fulltext information about that patent.